Up against pro-homosexual activist – debating the “gay relationship” agenda in elementary school. We’ve listened to – and been in – a lot of debates the radio and TV between pro-family people and homosexual activists. This is the gold standard of how to get it done without compromising. David Parker, in handcuffs, is lead into court following his arrest in April, 2005 over parental notification. Laura Tully protests against David Parker outside the Concord District Courthouse while David faces a hearing inside. 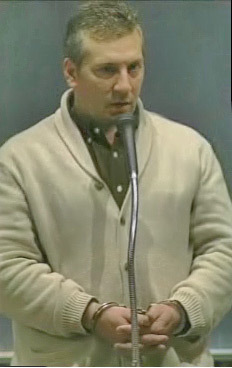 WBZ talk show host Dan Rea. 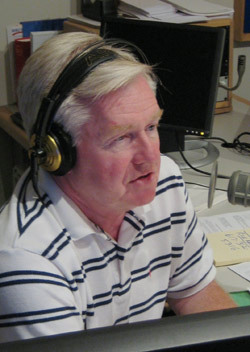 On Feb. 4, 2008, David Parker was invited to appear on the Nightside with Dan Rea, an evening call-in talk show on WBZ (1030 AM) in Boston. WBZ is a powerful 50,000-watt station that regularly attracts listeners and callers as far away as Virginia. Leading up to the show . . .
David was originally scheduled to be interviewed by himself to talk about his federal Civil Rights lawsuit against the Town of Lexington and the recent First Circuit judgment to uphold the dismissal of that case. David is suing the town over teaching homosexuality in the elementary schools without parental notification or ability to opt-out. The pro-homosexual group LexingtonCares.org – which was organized in Lexington to oppose (and harass) David Parker – heard the WBZ promotion for the interview during the day, According to the WBZ producer, people representing that group inundated the station with calls demanding that the station allow a representative from Lexington Cares to be there. So the station gave in. 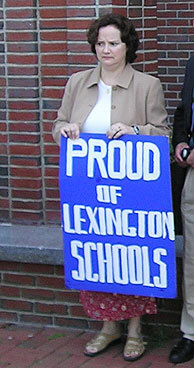 Laura Tully, a member of the group and virulent anti-Parker activist in Lexington, appeared on the show to debate David. Most of the discussion centered around the homosexual programs in David’s son’s elementary school, particularly the introduction to young children of homosexual relationships as normal “families”. The fireworks started up right away. David hit his stride early and never let up. He intelligently described his position and didn't allow the other side to frame the issue their own way. Dan Rea, unlike many talk show hosts, is not a conservative. He’s somewhat of a libertarian, with pro-gay leanings – to fit in with his audience that includes many gays and liberals. Rea inherited that time slot at WBZ about a year ago. For many years it was the domain of David Budnoy, a gay “conservative”, who died of AIDS, and recently Paul Sullivan, a liberal, who also passed away. However, Rea is not a knee-jerk liberal, even on this issue, as you’ll see.